Mac is pure sweetness. This gorgeous guy loves to play, but will easily take a break for some pets. 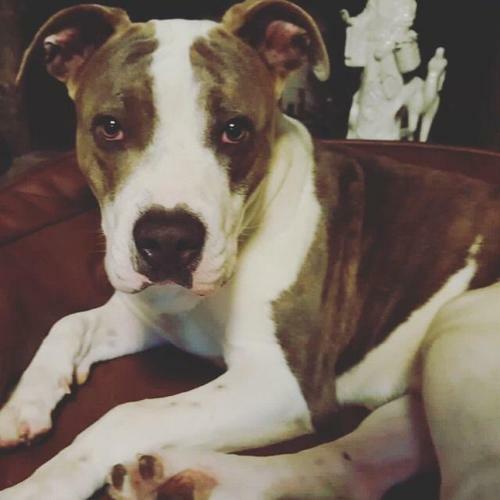 He is a 1 year old 58 pound, Staffy Terrier/American bulldog mix. Our boy is currently living in a foster home and would love to find his forever family. Mac is great with his foster's small dog and is a total cuddlebug. He is very responsive and will come running if he thinks there might be some attention coming his way. He's eager to receive that attention from everyone he meets. His love is contagious, and he has beautiful pale-colored eyes that will melt your heart. Mac would be a great addition to an active home that also enjoys sitting back and smelling the roses, he will provide a lifetime of entertainment and companionship! ?? ?